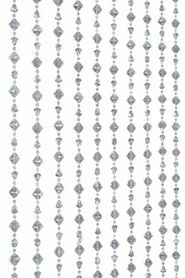 Our exquisite new gemstone beaded curtain is the result of many many many requests for a "chunkier jewel" set of door beads. 24 strands of beads hang 12 feet long from one 3 foot wide rod. You just take it out of the box and hang it right up....and you'll be giving new life to your space! This is the heaviest curtain we carry. It has tons of great detail with the faceted beads in various gemstone cuts. 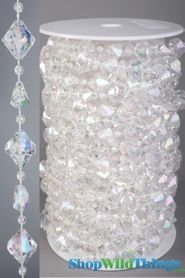 3" Wide x 12 Feet Long: Our wonderful heavy-duty acrylic beaded curtains are a perfect addition to any room! Use in the place of regular doors, closet doors, or behind a bed to add the look of height to any room! 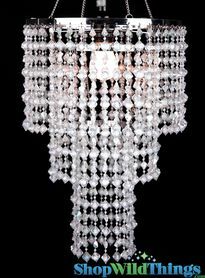 This clear curtain has an iridescent finish. 24 strands of B-E-A-utiful! 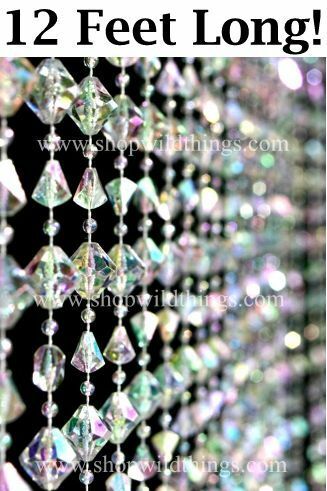 Each highly faceted bead is 1.5cm in diameter. All beads are attached, just hang it right up using two nails or two small c-hooks.